I enjoy books by this author! Thanks for the review! It sounds great. I don’t know if I’ve ever read Higgins. This sounds like a sweet book. I enjoyed the book. I have not listened to it. I have loved Kristan Higgins’s books ever since you first recommended her to me. I’ve read every one and she is my go-to author for a sweet romance with a lot of humor too. I enjoyed this latest installment, and I think Levi is my favorite character from her books. I’m looking forward to the next in the series. I recently discovered that Kristan is doing an on-line book talk on Booktalk Nation. It will be interesting to tune in. Thanks for another great review, Mary! I have to agree about Levi, Leslie 🙂 Thanks for the heads up on Booktalk Nation! So glad you loved this one and got so much enjoyment from both the story and the narration. Another author I keep meaning to read. You really should try her books, Stacy. This would be a good one since it’s the first in a new series. It was a fun audiobook too. “Laughs and love” – me too, Sheree! I think you’d love the audio. So glad Karen recommends The Perfect Match. I’ll probably listen to it as well – especially if Audible offers it as a whisper-sync special price if you buy the book (I’ve already pre-ordered the book). I listened to a sample of this on audible and really liked the narrator’s voice – she is new to me but I will check her out in the future. 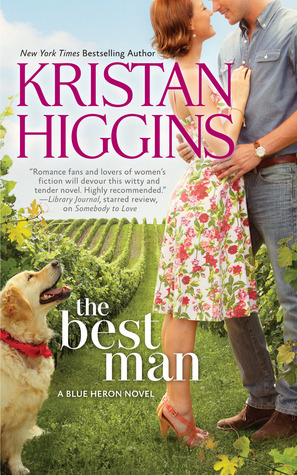 I really like Kristan Higgins and am looking forward to reading the first two books in this series. Kristan Higgins is on my auto-buy too! Though I have willingly been going through her books slowly. I am happy to hear you enjoyed this one – and isn’t it great how it’s a series? Her novels usually have so many characters, so have no problem imagining them in a series of books! I have her earlier books but am waiting to read them. Thinking I should do that soon. This sounds good. I’m ashamed to say I’ve never read any of her books although I’ve heard nothing but good things.